With the extraordinary popularity of skateboarding in modern culture, one would think that there would be more skate board games on the market. Each year there seems to be an endless barrage of new skateboard video games, yet the board game industry has not been able to formulate many mainstream board games involving skateboarding. Perhaps this is because skateboarding is difficult to emulate by playing a board game. Video games provide a more realistic experience, and of course nothing can top the thrill of actually skating. 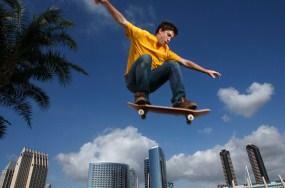 If you are searching for skate board games, there are a few options which might appeal to you. Let's take a closer look at one popular board game involving skate boarding. Playground Commandos is a skateboard board game which can be played with all the pieces from a standard checker set, as well as some additional coins. The game is quite simple and easy to learn. No need to use any complex chess strategies with this one. The black disks usually represent the skateboards. The red disks usually represent pogosticks. The coins usually represent trashcans. The game board should be set up as the picture below indicates, with the four squares of the center marked accordingly. The S stands for skateboards and the P stands for pogosticks. The skate boards belong to the defender, and the pogosticks belong to the attacker. Trashcans are neutral game pieces which are not placed on the game board during setup. The game begins with each player placing one trashcan on the playing field, alternating turns placing the trashcan. The attacker gets the first move of the game. When all six trash cans have been placed on the game board, each player moves one piece according to the rules for movement. Players alternate turns, and the attacker gets the first turn. Trashcans cannot be moved once they have been placed on the board. Trashcans cannot be captured and must be left in their original spot. Trashcans must be placed on empty spaces. Skateboards are allowed to make one diagonal move to either an empty space, or a space occupied by the opponent. Skate boards can also slide into orthogonally adjacent spaces and stop on an empty space, or a space that is already occupied by the opponent. Pogosticks are allowed to make one diagonal or orthogonal move to a space that is empty or one that is occupied by the opponent. The pogostick is also allowed to jump over any single orthogonal or adjacent diagonal space that is occupied in order to arrive at the next space that is either empty or occupied by the opponent. Jumping over an occupied space of any piece is allowed, whether it is owned by the opponent or is a neutral trashcan piece. Pogosticks are permitted to jump over trashcans, but the skateboard is blocked by trashcans and cannot jump over these obstacles. Captures occur when a piece is moved onto a space that is occupied by the opponent. The piece that is captured is immediately removed from the game. The attacker (pogosticks) wins the game if all the opponent's skateboards are captured, or 4 pogosticks get positioned in the central 4 squares of the game board. The defender (skateboards) wins the games if there are only 3 pogosticks remaining on the board. Playground Commandos is a skateboard board game that is easy to play because all it requires is a basic checker board, the pieces, and a few coins. Since checkers is one of the most loved board games of all time, checker boards are very accessible. There is an enormous market for skateboarding, but videogames seem to have cornered the market, and there are very few board games involving skateboarding. Skate board games are popular in any form, but most professional skate boarders seem to have etched their names into video games. This leaves skateboard board games largely up to the imagination. You can always make your own board games.